The Madoo Conservancy, located at 618 Sagg Main Street, Sagaponack, NY is an extraordinary garden that is a one- of- a kind place. It was "settled" in 1967, when the late artist, Robert Dash, purchased a cottage and a small plot of land there. As an artist, poet, and landscape designer that toggled freely between these pursuits, this site was his home and canvas for the next 40+ years until his death in 2013. He left behind an incredible collection of paintings, sketches, poems, and a horticulturally diverse and rich landscape that is all under the auspices of the Madoo Conservancy and it's executive director, Alejandro Saralegui. The site is 2 acres, which is a generous size, but it feels huge. Part of the reason is the layering of space with vegetation, and the creation of garden 'rooms', but also unexpected moments and focal points. You kind of lose yourself in the site, which feels disorienting but in a way, cool too. The garden is a cocktail of historic and geographic influences. This Japanese- inspired bridge, structure, and man-made frog pond are theatrical and whimsical. 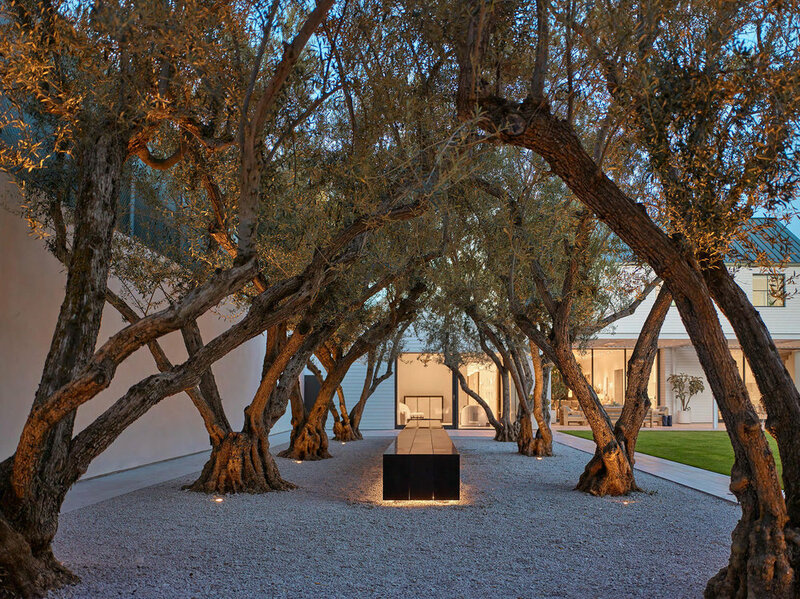 Alejandro explained that Madoo recently completed a major renovation to his old studio, and it is now used to display his paintings, which are mainly of the surrounding landscape. The barn retains it's historic character, with old beams in tact. Dash left quite a collection behind, and select works are currently for sale at Madoo. 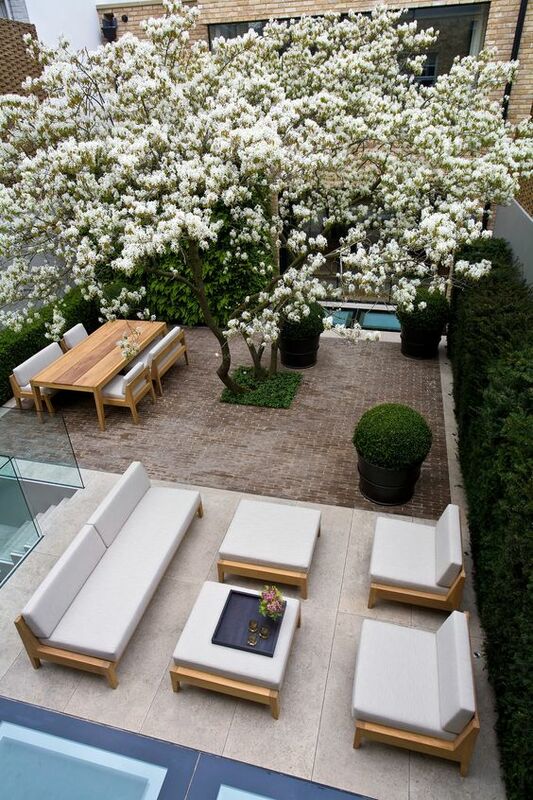 One of Dash's most widely celebrated contributions to landscape design is his 'Gingko Grove', planted with a mix of fastigate Gingkos and boxwoods. A sculptural and somewhat surrealist landscape with an Alice- in Wonderland quality. Looking up offers an even more dramatic view. As we walked to what seems to be the deepest part of the garden (who actually knows where we were in relation to anything else there), we came to a room that was Italian-inspired, with an architectural Hornbeam archway framing a parterre of fruit trees. What I love about the garden is how completely unrestrained, unrelenting, and daring it is. This alle was all about the forced perspective, and the rill of water from one end of the room to the other. The cottage visible at the end is absolutely adorable inside, and is available to be rented during the summer months. The garden is also available for outdoor events. 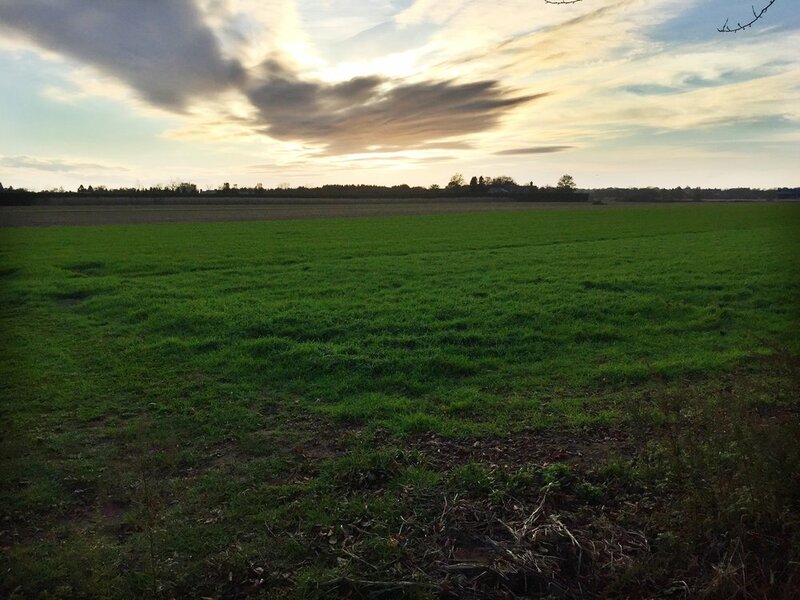 The views from Madoo of the surrounding farmland are still extraordinary in Sagaponack. Thank god there is still some left. 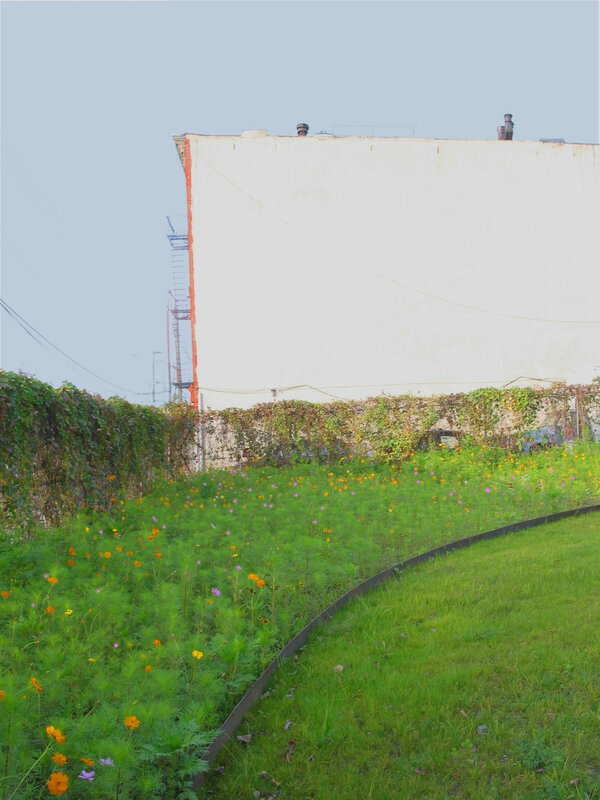 If you are in the market for an unusual and incredible Brooklyn experience, Kingsland Wildflowers is an absolutely surreal green roof landscape that is located atop an industrial building in a sea of urban-ness in the middle of Greenpoint, Brooklyn. Designed and installed by Alive Structures, it has been funded by several not- for profits as remediation for one of the largest oil spills on record, The Newtown Oil Spill which poured between 17-20 million gallons of oil into the Brooklyn waterway over many decades. The project contributes additional habitat for butterflies, insects, birds and other wildlife affected by the ecological devastation incurred. Alive Structures began the installation of the green roof in the summer of 2016 when they installed10,000 sq. ft.of wildflowers, and continued to install another 10,000 sq ft in 2017. There are two intensive green roofs which are open to the public and have 6” of green roof soil medium and 2” of drainage mix beneath it. 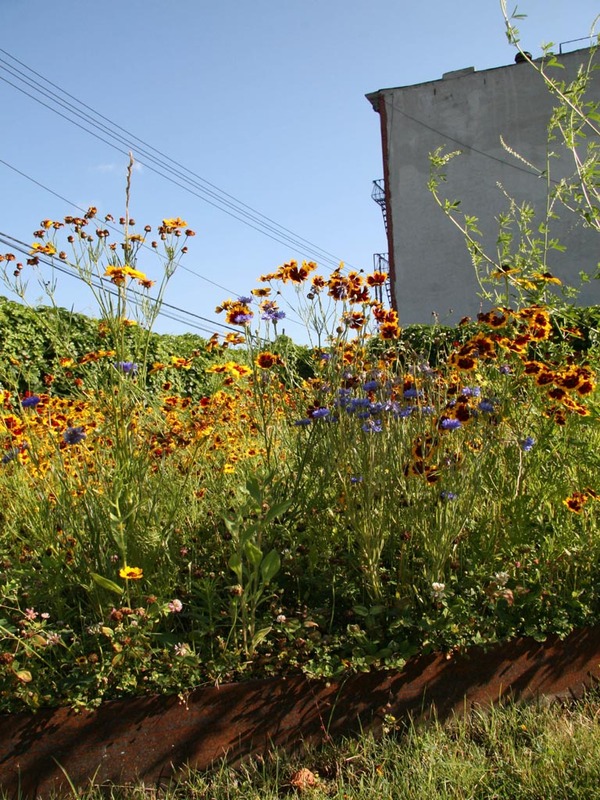 The intensive roofs are planted with a mix of native grasses and native flowering perennials. As it is brand new, it will be very cool to see how this landscape evolves over time. 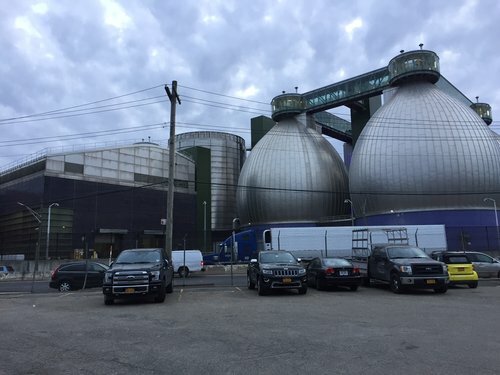 The big stars of the show are the incredibly unusual futuristic "Digestive Eggs" that are actually the Newtown Creek Waste Treatment Plant. Designed in 2010 by Polshek Partners, these "eggs" process between 1.3-1.5 billion gallons of sludge per day. The forms on the skyline are a perfect juxtaposition with the wildflower meadow, and the waterways are the cleanest they have been in 100 years as a result of this waste treatment plant. 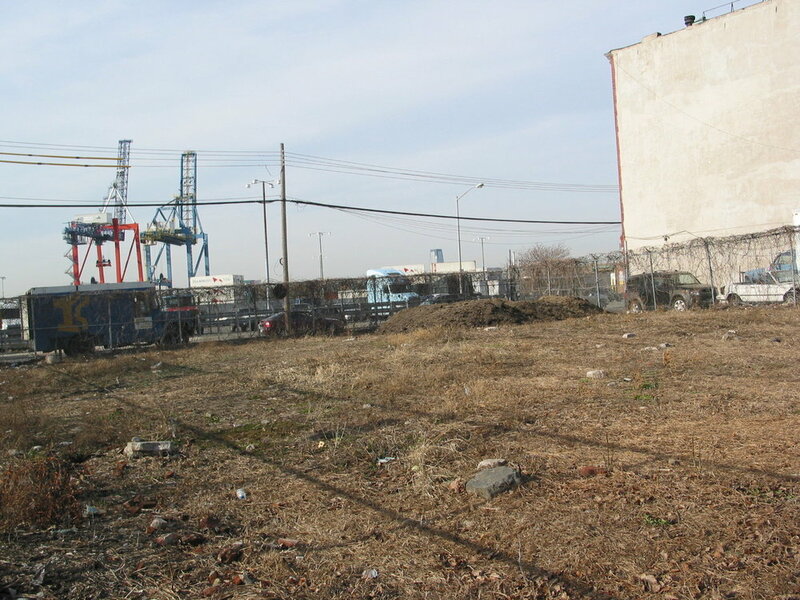 The project has been funded by several not-for-profits including Greenpoint Community Environmental Fund, the New York City Audubon, Newtown Creek Alliance, Broadway Stages, and The Fortune Society. And a big thank you to garden designer Marni Majorelle of Alive Structures for supplying images and information on their lovely project. The Parrish Art Museum, by the Swiss architects Herzog & de Meuron, is a perfect example of understated done just right. 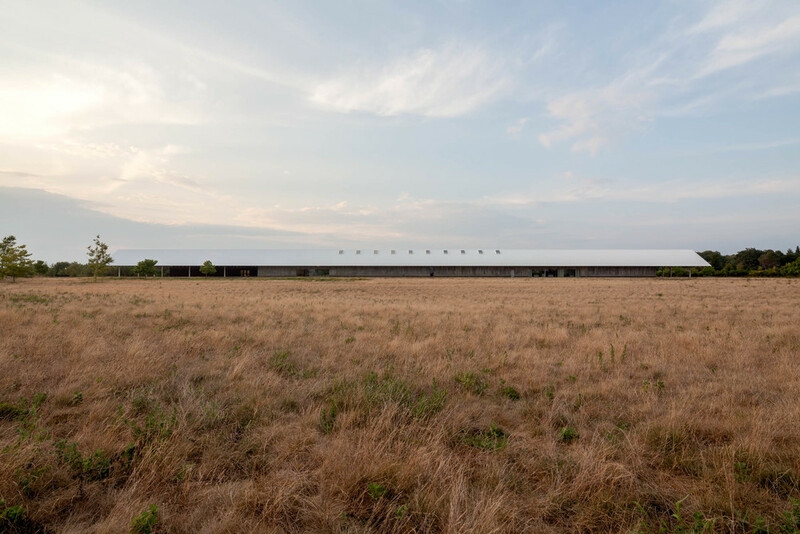 It evokes the sense of "barn" without being too literal, and is simple,and elegant. It consists of a central spine, which are two gabled roofs side-by-side, and each is 615 feet long, which is a powerful proportion to observe in person and almost impossible to capture in a photograph taken by me (although well done by above photographer Jane Messinger). It houses an exquisite collection of modern art by Long Island artists such as William Merritt Chase, Childe Hassam, Albert York, and Fairfield Porter, and larger works by Chuck Close and Eric Fischl and Donald Sultan. It is sited in a landscape equal in it's power to evoke a sense of the local ecology and meadow landscapes that are native to the east end of Long Island. The landscape, brilliantly executed by Reed Hilderbrand, serves as a quiet yet exquisite canvas against which the architecture can be experienced and appreciated. Three paths connect the parking area, which is kept deliberately separate from the building. The landscape is a restored meadow and is described by it's designer, Douglas Reed as "dynamic and constantly changing". Opportunities to take in the landscape are offered along the oversized paths along the exterior under the roofs. The entry provides a giant gathering space under gabled roofs made of corrugated metal, supported by concrete walls evoking a sense of a barn without being too literal. Brooklynites love their outdoor space. With NYC growing more dense by the second, and opportunities for green space dwindling, gardens or open space of any kind is a supreme luxury. And while garden stores are not a-plenty around here, some of the ones we have are verdant urban gems. Here are three Brooklyn garden stores and one Home Furnishings store, all in different Brooklyn neighborhoods, and each impeccably curated by their loving creators. I recommend a visit to any and all, whether to spruce up your home, garden, maybe find a gift---or just a visit to provide a needed infusion to your hardened city soul with something soft, green, stylish, and happy. A beautiful, warm and thoughtfully curated collection of some of the most classic, tried + true (and also reasonably priced) items for gardens, like Fermob furniture (all pieces available for order), Ben Wolff Pottery, Campo De Fiori planters, and a stunning assortment of both cut flowers and native perennials in the lovely owner, Susanne's, garden space in the back of the store. Amy Gardella's Seaport Flowers is an overwhelmingly visceral and sensual store, with an incredible collection of unusual plants and cut flowers that are divine.I am always stunned by the quality and range of her flowers and plants. Her eye for color is incredible and she uses it sparingly...so each flower she incorporates can be read and appreciated with clarity. She also has a beautiful array of good, house wares and handmade objects and other. Inspired by her Grandfather and his garden, Amy's childhood passion is translated to a sensorial gift to the neighborhood. 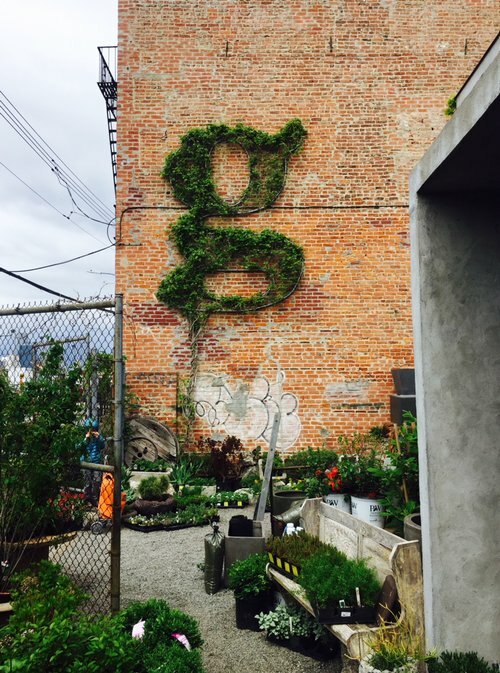 The Gowanus Nursery, located in Red Hook, Brooklyn, is a juxtaposition in terms. Situated right in view of giant shipping cranes, and the busy industrial harbor, this nursery literally radiates vegetation, pushing meadow grasses, Asters and Goldenrod out onto the sidewalk, overtaking a chain-link fence, and and jumps across the street and along the Brooklyn Greenway bike path. It's owner, Michele Palladino is an expert horticulturalist with a keen eye for beauty and a passion for plants that is contagious when you go. She also has plants for indoors located in the office, as well as a collection of trees, and many plants she propagates from seed. Hours of operation are sporadic, so be sure to check before planning a visit. 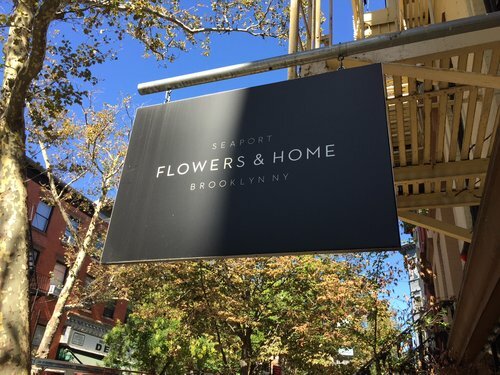 While not defined as a "garden store", Homestories, located in the heart of Brooklyn Heights has a unique sensibility all to itself and transcends traditional lines defining indoor/outdoor boundaries. Minimal, serene and artfully curated, their collection is organic and artisanal, with pieces that are flexible and could be used either indoors or out. The store's founders, Sophie and Paul Yanacopulous-Gross, are Swiss and they are also design perfectionists. Thy carry the entire outdoor furniture line by Paola Navone, called Gervasoni, as well as lighting by Flos, a furniture line by the owner, Paul, and ceramics by Nelson Sepulveda. I love their bowls, mugs and baskets too. Recently, my colleague Mark went out to Edinburgh, Scotland and came back with all of these incredible photos of Edinburgh. While there, he visited a sculpture park that he reported as highly extraordinary, called Jupiter Artland. Basically the story of the park is that in 1999, a couple by the name of Nicky and Robert Wilson purchased a large manor house within an 100-acre estate. After living there a few years, Nicky, who had always been passionate about art, recognized that the formal gardens, fields and woodlands surrounding their historic house suggested the perfect site for a sculpture park. The park is both a canvas for artist's installations, and a preserve of the natural landscape. Artists take full advantage of the incredible natural beauty inherent to this site by recognizing the specific physical attributes of the landscape as a feature--Andy Goldsworthy, Alec Findlay, Sara Barker, Anish Kapoor, Charles Jencks, and Ian Findlay are just a few a few of the artists and landscape designers whose work seamlessly connects with the physical landscape. So, if you are headed out to Scotland any time soon, it's a must see. The renowned landscape architect, theorist and historian Charles Jencks work, Cells of Life, recalls the process of Mitosis and fractal geometry. The English sculptor Antony Gormley's work, entitled Firmament is a single 'expanded field' sculpture constructed from 1019 steel balls held in the space by 1770 steel elements of different lengths, welded together to create a non-regular, polygonal structure whose form dissolves and resolves in space. Called A VARIETY OF CULTURES by Scottish artist and poet Alec Finlay, this work was created for Jupiter Artland and is an essay in eco-poetics - it will grow, season by season. It consists of an orchard of native apple and plum varieties with the addition of oak ladders. 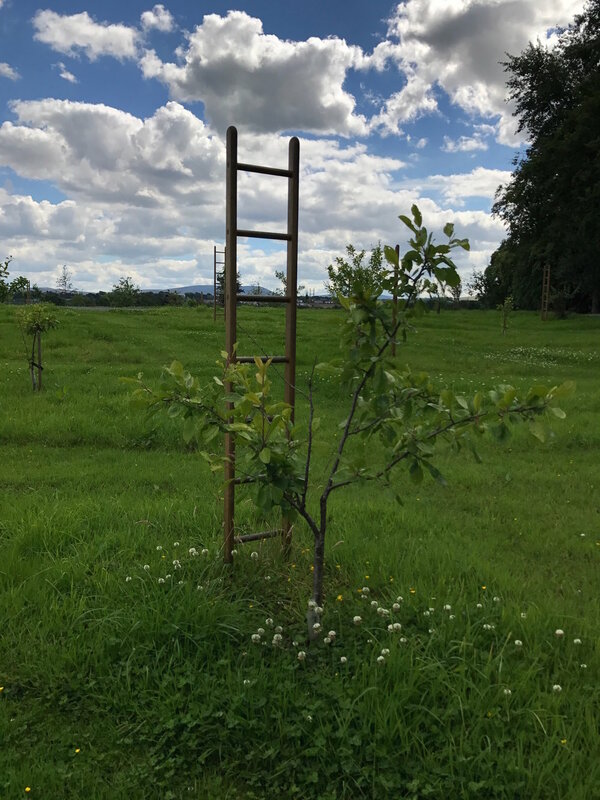 Placed near the trees, which are still young, the measure of the ladders anticipates the eventual extent the pruned canopies will fill – when they do, visitors will be able to climb into the blossom, leaves and fruit. I love how it is simple, aesthetic and also measures time in a way that is interactive and engages so directly with the earth. Brilliant. 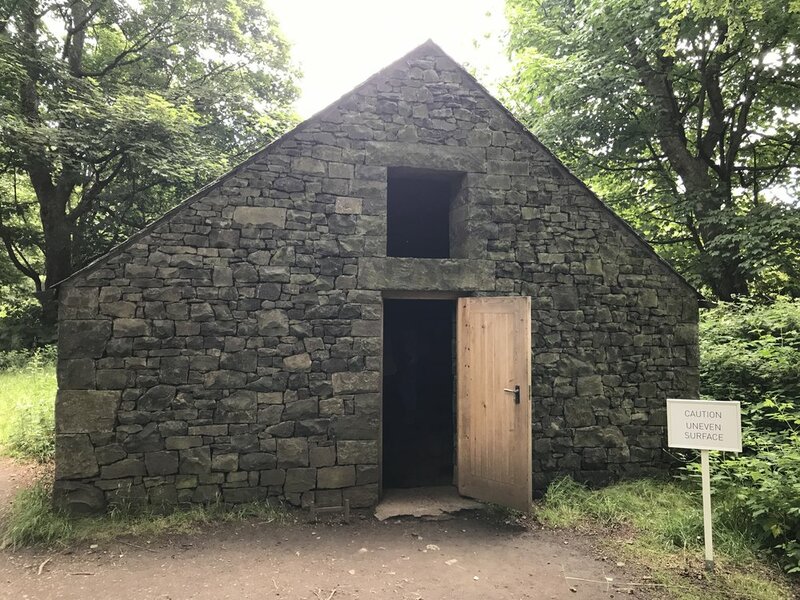 Stone House Bonnington, by artist and sculptor Andy Goldsworthy, is a structure built in Basalt stone (found 2 miles from the site) around an unearthed groundplane of bedrock stone beneath the existing landscape. 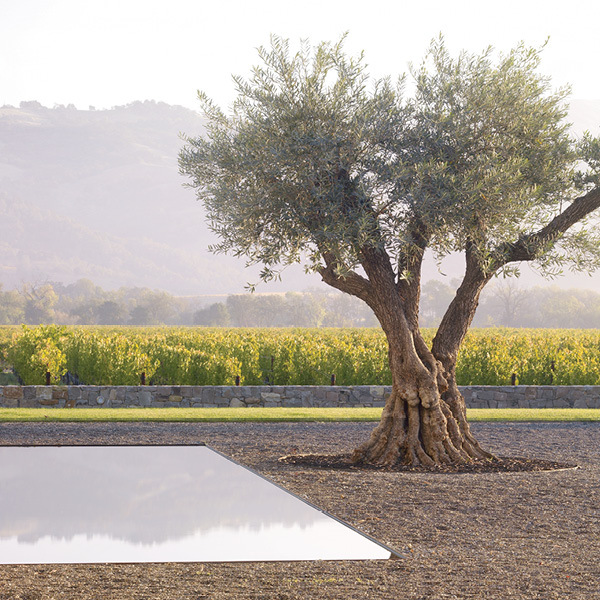 Andy Goldsworthy produces site-specific sculpture and land art set in natural and rural settings. His art involves natural and found objects to create temporary and permanent sculptures that reflect the character of their environment. He is well known for his ephemeral pieces which are made from natural materials such as snow, ice, wood, flowers, leaves, sand, mud and twigs. Stone Coppice is also a work by site specific sculptor Andy Goldsworthy. Here the artist engages with a what is known as a copse or coppice, which grouping of trees which have held seeded by throwing off shoots below ground to create a density. With this temporal piece, the artist has placed large boulders between the trunks, creating a tension between the two materials, the lightness of the trees juxtaposed with the weight/ volume of the boulders... and with time the trees will grown around them and the stone will eventually push into and grow with and into the tree trunks. and with time the trees will grown around them and the stone will eventually push into and grow with and into the tree trunks. I am thrilled to announce that Landstylist's very own Contributing Editor, Mark Thomann of the American studio whY design just won a large international competition for a new events park in Edinburgh Scotland that will feature a new events pavilion overlooked by Edinburgh castle, and a series of glazed pavilions topped by wave-shaped roof gardens. It is so incredibly exciting and the design, exquisite. wHY partnered with Edinburgh's office called GRAS on a proposal for the 32 million dollar Ross Pavilion, and was selected ahead of six other teams including BIG, West 8, Adjaye Associates and Sou Fujimoto Architects. Competition Jury Chair Norman Springford said: “We thoroughly enjoyed meeting all the shortlisted teams and understanding each approach. However with wHY, they demonstrated an impressive collaboration which respects and enhances the historical context and backdrop of the Castle and the City, whilst creating new heritage and increasing the green space within the Gardens. All of which were key aspects for us all and respected the importance of the space within a World Heritage Site"
Located at the Eastern fringes of Bangkok in the suburban district of Prawet, and not far from the Suvarnabhumi International Airport is an incredibly important project called The Metro-Forest Project. 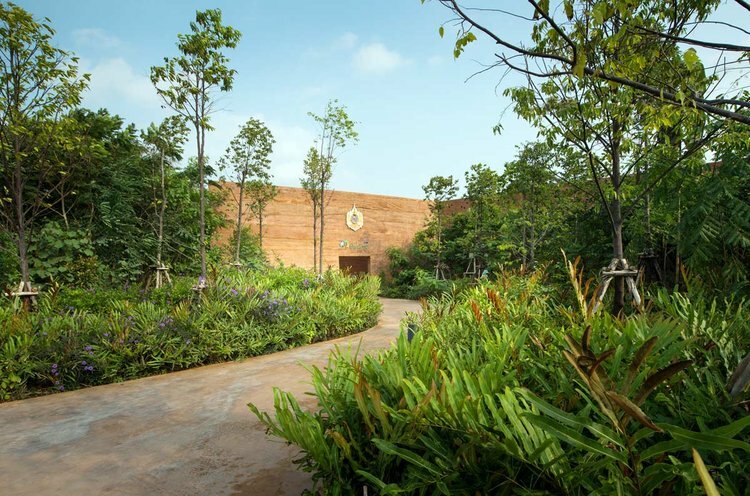 It's an urban ecological regeneration project designed as an outdoor exhibition space to cultivate green awareness and educate visitors about the importance of preserving the local forest ecology. The project occupies an abandoned 4.75 site and it's main purpose is to reverse the trends of suburban sprawl, urban heat island, and flood-prone developments through the incorporation of historically local (native and introduced) lowland tropical tree species as well as trees of historic significance. 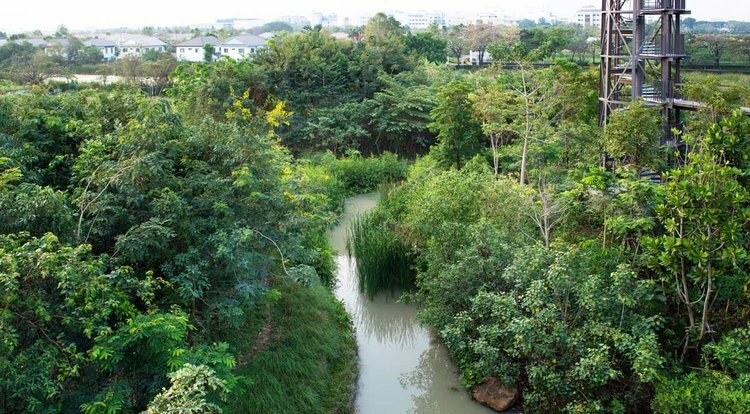 In early 2012, the PTT Reforestation Institute commissioned the landscape architects of Bangkok to design a space for reforestation. Initial analysis indicated the dredging of soil as the excavation created pits for illegal refuse dumping, inspiring them to create a new terrain for forest regeneration. Non-compostable waste was cleared while the rest was allowed to decompose. Approximately 37,000 cu.metres of earthwork was introduced and graded with 6,000 cu.metres of planting soil to create a suitable terrain. Berms and topography create little"micro-ecologies" which lend to it's ecological diversity. They also implemented a pre-mixture of highly fertile, organic soil (3-parts Topsoil, 1-part Raw Rice Husk, 1-part Coconut Coir Dust, 1-part Chicken Manure) as a soil medium suitable for the lowland species saplings. A skywalk + observation tower were designed to minimize disturbance of the burgeoning forest and allow close-up views of the maturing canopy. As re-forestation was a huge priority, approximately 60,000 trees of more than 279 unique species were planted on approximately 75% of the overall site. Maintenance of the site will look for the forest to manage itself, as no management is the best management. However, as the forest matures, a practice of rotational forestry through predictive-modeling or forecasting of its succession will be implemented as the continuously on-going project evolves over generations to come. 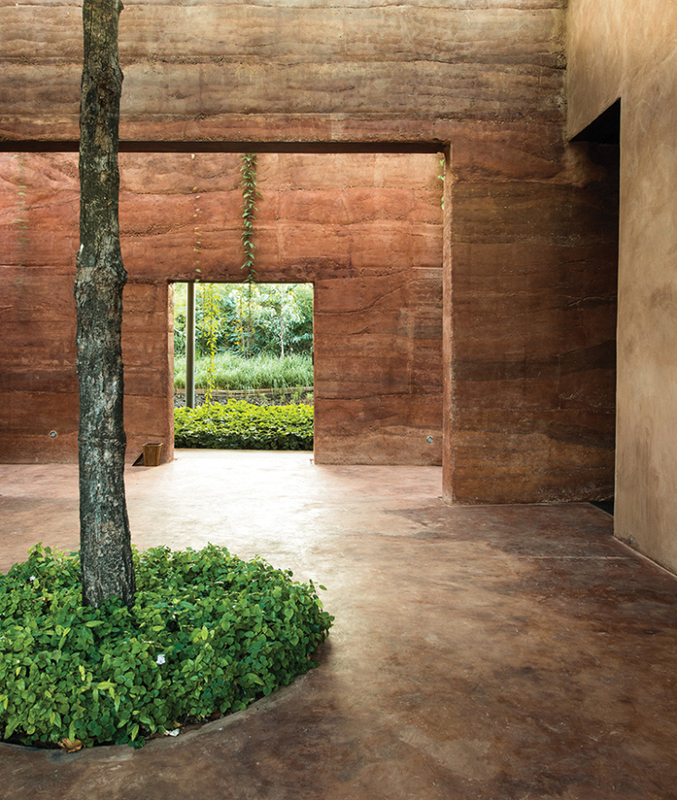 The project, which received LEED Platinum NC, is truly a public outreach commitment by the PTT Reforestation Institute to inspire public awareness of forestry management and the importance of environmental stewardship in Thailand as the design by the Landscape Architects has become an extension of the curved wall rammed-earth exhibition center from indoors to outdoors. The site has also become a new habitat for fauna to establish their home and visitors to observe. GOVERNOR'S ISLAND GOT A NEW PARK. IT'S CALLED "THE HILLS", AND IT'S AWESOME. Governor's Island is a 172 acre island in the heart of NYC's harbor and has recently been transformed into a beautiful public park, complete with giant rolling hills, playgrounds, bike paths and a hammock grove. It's open May 1st through October 31st 10AM-6PM, and weekends 10AM-7PM and is accessible by a ferry. The quick backstory: Until recently, it had long been the home to an abandoned military base dating to 1811. the land was finally transferred to the City, Bill Clinton designated 22 acres to be put into a land preserve. 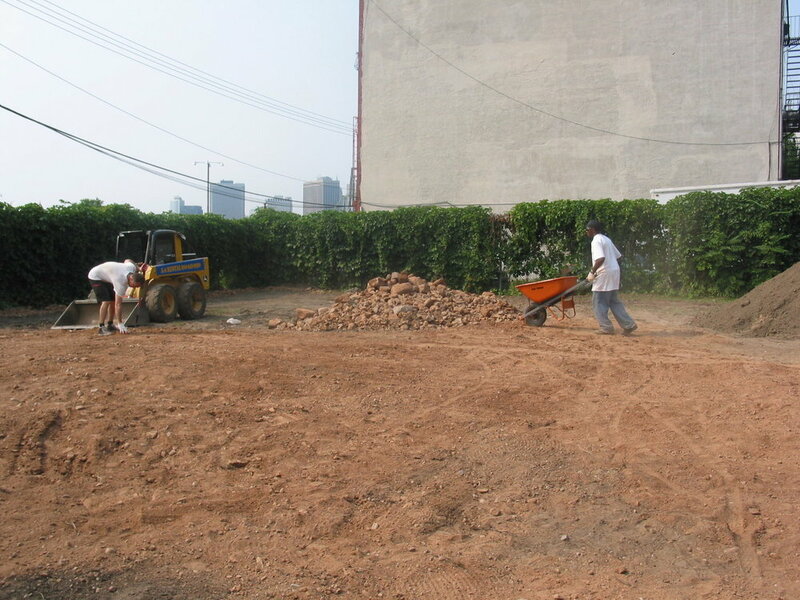 The remaining 150 acres was re-imagined as a park by the Trust for Governor's Island, and non-historic building were demolished. Now, two phases of the Park are finally done: in 2014 the first phase was completed as 6 acres of parkland and pathways, a 10 acre hammock grove, and 14 acres of play areas. In 2016, Phase two, known as "The Hills", was completed which are giant hills rising 70' above NYC's harbor with paths and overlooks that use recycled materials from the harbor. 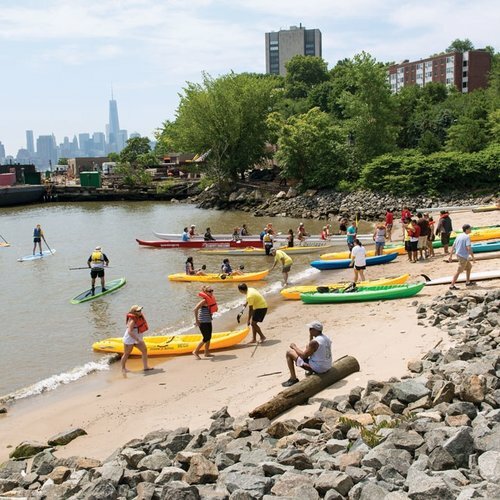 So much to do: they provide for activities like biking, food, festivals, picnics, playgrounds, art installations, plazas, fountains, kayaking, sunbathing/lounging, and 360 views of NYC harbor. You can get to the island easily by taking the Governor's Island Ferry from both Manhattan and Brooklyn. For more information you can link to the Govenor's Island website here. outlook hill is made of granite blocks from the old island sea wall. I found some historic photographs along the way. This was the Mother Cabrini Church, circa 1930. You can see the playground beyond the lot. It seemed weird to have a giant vacant lot that was owned by the Parks Department and trash-strewn next to a playground. Like of course it should be something...so we proposed an urban meadow that was simple. Rolling grass hills, dogwood trees, and wildflowers. Many people think meadows are an instant landscape. Much to our disappointment it was not an insta-landscape. Fortunately, Brooklyn breeds awesome weeders. These were a couple of those types that came with their game faces on. The American meadows Northeast Mix worked. American Meadows is a site that I use all the time for plants, and they supplied the meadow mix I used. Based in Vermont, they contract with growers in California and Oregon, and they hand -pack their seeds in their warehouse with love. As they have been around for 30+ years, their process for making seed mixtures and propagating plants is tried and true based on decades of research as well as trial and error. They also have excellent customer service, and I find myself using their website as a resource all the time to learn about various mixes and perennials. In addition to a slew of different types of wildflower mixes suited to different areas and conditions, they also provide perennial plants, bulbs, and even the tailored customized mix for your specific project type. I don't know if you can see, but there is a hydrant tucked not he left side of the site. That was my water source in the sense that I would hook a fire hose to it a couple times a week in the summer months. But this established in July, with very little rain and no irrigation (except when I stuck the fire hose on it a few times, which was pretty hilarious to watch considering I am actually not a fireman). The typical lawn grass is one of those things we have taken for granted as the only way to have useable outdoor space that isn't paved. But it is not only a pain (i.e. the mowing factor and irrigation), but they are also unhealthy in terms of fertilizers, weed killers, and not to mention they require sunlight, which many backyards just don't have. Enter: Carex. Carex is a no-mow perennial substitute that does great in shade, and is drought tolerant. It will not have the same tailored look as tight grass lawn, but it's all about what you get used to. I mean, look at men's face's these days. Overgrown is IN. This delicate perennial grass sways so gracefully in the wind it is hard not to fall in love with it. It is also extremely drought-tolerant. It grows in clumps ranging from 12"-24", and looks beautiful en masse. Great to stabilize a steep slope, and grown well in well-drained soils, but also just beautiful in a planter. Gardenista featured this grass in an entire article and ways to use it. This really is one of my all time favorite plants, not just favorite ornamental grass. It survives the toughest of environments, has a very strong vertical appearance and is graceful and elegant the wind. It's among the earliest flowering of the grasses, and its is beautiful all year. Deep green blades with extra fluffy sandy fronds with deep purple accents in June. As the seeds mature the flower stalks turn golden and take on the appearance of shafts of wheat. 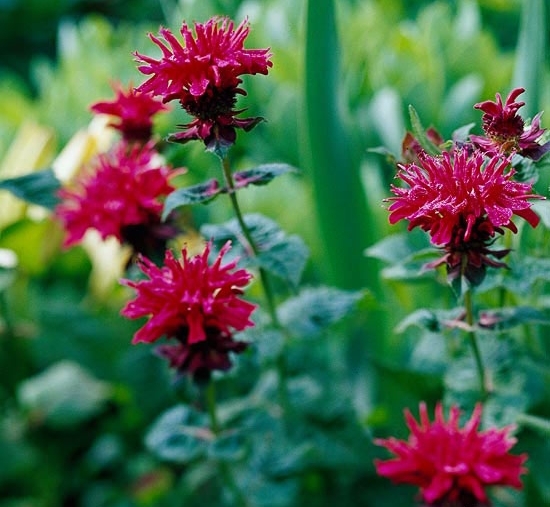 It is an absolute must- have in a garden. I don't know about you, but when I walk along the High Line, I feel like it is almost impossible to take it all in. First of all, you're elevated, and weaving through buildings in NYC. When has that ever happened in a city? Your vantage point for seeing the city is totally changed. Then there are the layers of a rich and complex landscape architectural design to observe and experience (design provided by Field Operations)--the hardscape, benches, design detail, people,art, architecture everywhere. And yet, beyond all of this excitement and sensory overload, the real show stoppers are... the plants. There are so many, (hundreds in fact) that it may feel overwhelming to actually consider which ones might actually work in your garden. So I thought I would use my rooftop garden as an example of plants that were inspired by the High Line, that do so well with so little maintenance that it's hard to believe sometimes. The thing about the High Line plants that is important to note is that they are, for the most part, extreme sun-lovers. There are micro-climates along the High Line--places with more shade and different soil conditions--and therefore the plants have been tailored to those specific environments. But generally speaking, these plants love sun and are also tolerant of wind and urban conditions. There are plants that took hold along the High line when it was an abandoned railway, and they are considered native plant species , and so they have been incorporated, and represent a significant portion of the current planting design. As I mentioned, it was hard not to be moved by the High Line, and when we moved to our current home, the only open space was up. So it made sense to look to the High Line for guidance with our home project. My garden's main ingredients: Ipe wood decking, River stones, Fiberglass Planters (from Planter resource) Soil and Plants. Then there are the secondary features, like lighting (by Jesco and Bega), Synthetic lawn (by Syn lawn) irrigation (all drip), a BBQ and BBQ area with a built in refrigerator for wine and beer, mostly. The soil and stone were hoisted up by a cherry picker from the street, which seemed insane at the time, but it all worked out. 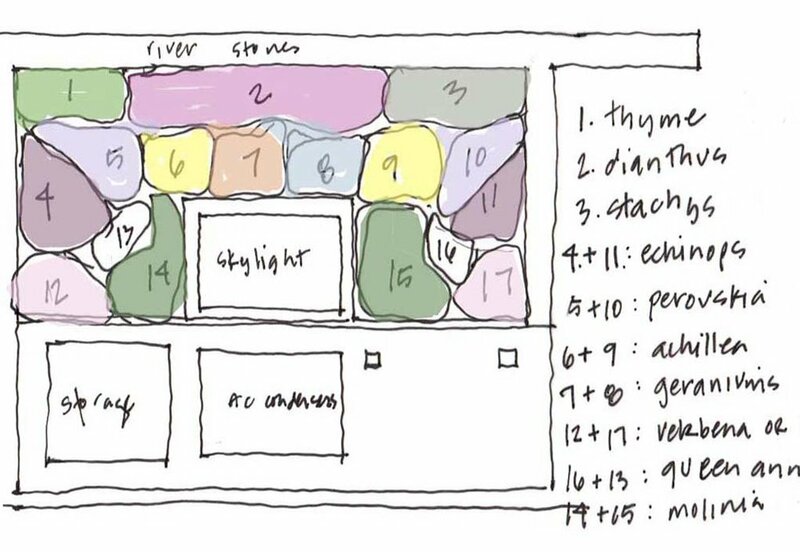 I wanted the diagram to be as straightforward and simple as humanly possible. So the walkway is the main axis connecting two areas, one for lounging, and one for dining. The dining area (square deck on right) is oriented towards the Manhattan view. Then over-layed onto that was lighting, bbq area. A tricky thing about roof gardens is the allowable area that you can cover the roof with materials that are considered to be "combustible", i.e. can catch on fire. Regulations vary according to City (and year) so check your local codes. This was a determining factor in the design because the use of wood decking had to be limited. I know seems like a strange question--a weed is a weed. But in fact, a weed is by definition "a wild plant growing where it's not wanted". So actually, if you really think about it, they are just like any other plant, not inherently evil as so often regarded-- but maybe just plants that often find themselves not in the right place at the right time? So why do we discriminate? Sad, right? It's actually pretty interesting how weeds all got started, and if you are interested, Peter Del Tredici is a rockstar in the plant world, and has written a fantastic book called Wild Urban Plants of the Northeast. You can find Peter Del Tredici's book Wild Urban Plants of the Northeast on Amazon. In his book Del Tredici speaks scientifically about the positive contributions of hundreds of plants, considered to be "weeds", but are actually just seriously hardworking, adaptive plants that are usually unwanted where they establish themselves. He talks about urban plants and their ability to overcome the so many urban stresses (stressed --here? ), whether caused by paving, salt, soil compaction drainage problems or air pollution, and their story makes you root for them (no pun intended) because they are the over- performing and under appreciated underdogs. In a way, the plants that have been able to use and transform human disturbance to the best of their ability in order to thrive and act positively with benefits to the environment are actually the plants we are most often pulling out of our gardens. Del Tredici specifically looks at 222 plants that spontaneously germinate in the urban context, and while you might not read it all in one sitting,or at the beach, it is an excellent reference especially if you are curious when you pass a vacant lot and wonder what is growing in it. He uses the Tree of Heaven as a perfect example of plant discrimination. 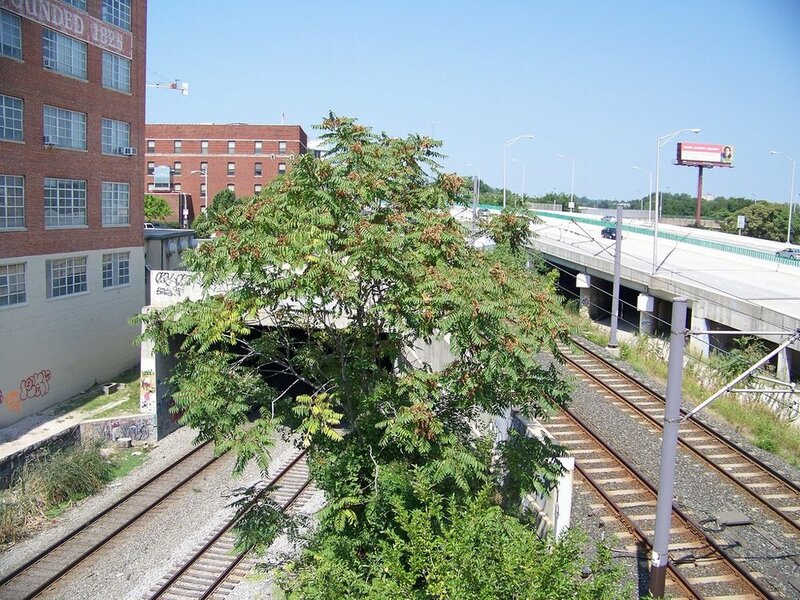 The Tree of Heaven is a tree that grows anywhere and everywhere, and now that I have mentioned it you will see it on the sides of highways, growing out of buildings--everywhere. It is actually the Tree that is featured in A Tree Grows in Brooklyn. Chicory is one of my favorite weed plants by the roadside. They grow July through October in areas with high lime content and higher acid level (so roadside is it's perfect habitat) and are pollinated by bees. Looks great with Queen Anne's Lace and Fescue. 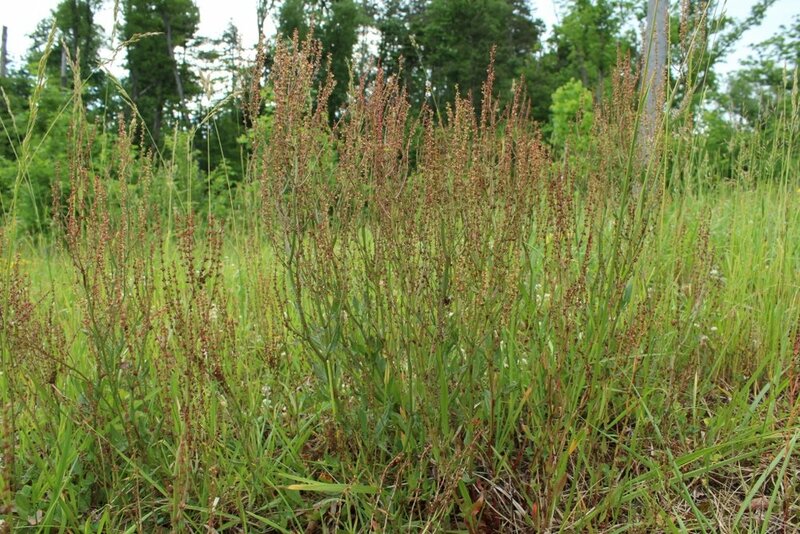 Tall Fescue is one of those grasses you see all the time in medians between lanes or by the side of the road. I personally find it incredible that such a beautiful grass grows naturally...it's also called Kentucky fescue, tall Ryegrass and gross up to 2' tall. It was introduced in the late 1800's as grass for livestock. It grows in sun or shade, germinates from seed and is wind pollinated. Red Sorrel is a semi-evergreen perennial that grows to 18" and does well in full sun and poorly drained soils. It speaks through rhizomes so it can form large colonies. White Clover is a mat forming ground cover that has been a crop for farming since the 1700's and can actually improve the nutient content of disturbed soil. It is commonly seen in minimally maintained lawns although has recently gained momentum as a natural component in organic lawns. Del Tredici research all points to a very important fact that "weeds" are actually just incredibly successful reproducers and are doing a better job at co-existing with human development than other species. The "playboys of the plant world, if you will. In the age of climate change urbanization, and a rapidly warming globe, these fighting plants are actually more valuable than we know. Their ability to spontaneously adapt and regenerate will play a bigger role in our future ecology. Chicory is one of my favorite weed plants by the roadside. They grow July through October in areas with high lime content and higher acid level (so roadside is it's perfect habitat) and are pollinated by bees. 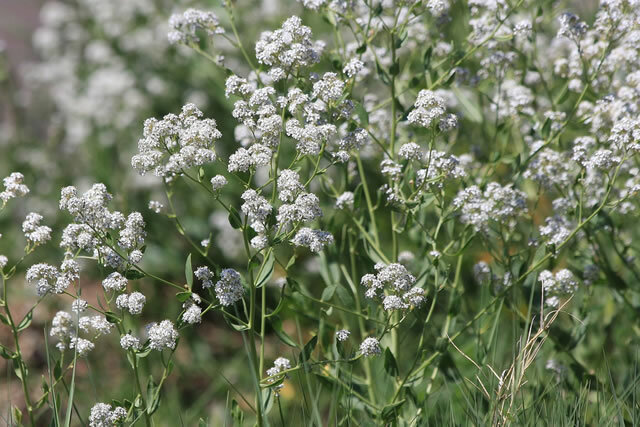 Pepperweed has flowers that are dense spikes with white and green flowers. 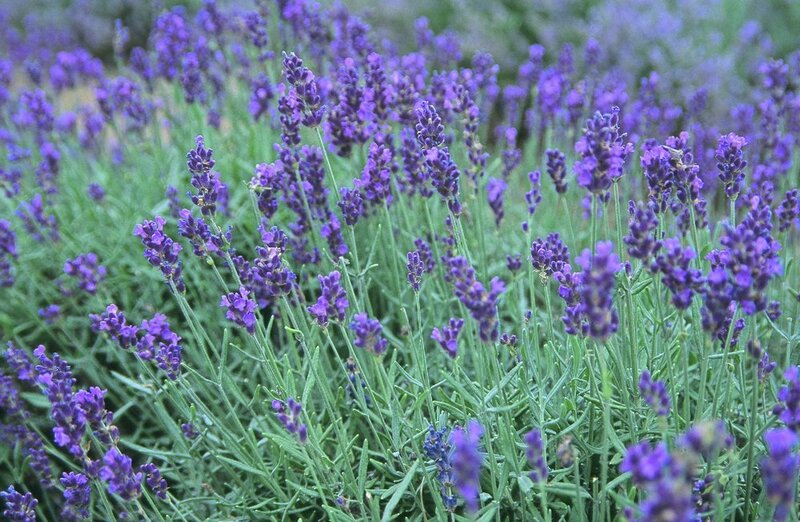 Native Americans used it to treat diseases and rashes. It colonizes empty lots and bare soils. Del Tredici maintains: we should learn to appreciate the brave new ecology we have imposed, and learn to appreciate weeds as the opposite of our enemy--they are actually the plants that are working the most on our behalf. I am always on the lookout for materials that are sustainable and weather well. Wood is a material that I find slightly difficult to select, mainly because I am always worried about the environmentally negative aspects of using wood like Ipe and teak, which I love, but it is actually terrible because it is harvested from countries that are losing their forests quickly. 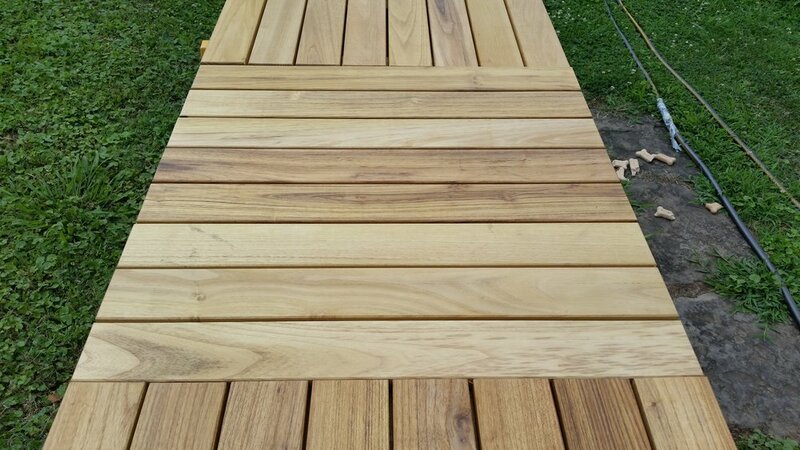 Recently I came across a product for decking that is made from Black Locust wood (tree is called Robinia Pseudoacacia) from Robi Decking, which is picking up in popularity. Not only is Black Locust one of America's stiffest and strongest woods, but it is from a tree that is harvested in America, and is not endangered. Unlike Ipe and Teak, which are often taken from forests in Brazil and other parts of the world where they need trees the most, Black Locust is extremely fast growing and is available throughout many parts of the US, like Virginia, Kentucky, Indiana, Ohio, and North Carolina. I spoke with Mike Caruso, who works with Robi Decking, and he is passionate about their craft. He has been harvesting this wood for over 25 years, often from the floors of forests where it has fallen, and creates planks that are 4", 6" 8" and 10" long and last 30+ years. Robi Decking recently was installed on the roof of the Brooklyn Children's Museum. If it is good enough for Brooklyn children, that should tell you something. The Redbud tree is a small, resilient deciduous tree that in the Spring has tiny pink flowers that appear to grow right from the twigs and branches before they leaf out. They are absolutely exquisite in early Spring, and then in the late summer their large heart shaped leaves turn golden. They also have a very graceful, rounded form, It's also very undemanding about it's growing conditions, which makes it a welcome addition to any garden. Serviceberry is a native deciduous ornamental and comes in both tree and shrub form, and there are many varieties to choose from. They are low maintenance, tolerating various degrees of shade and sun, with small white flowers in spring and yellow to red Fall color. I love their form--they are smallish (3-20' tall) and multi stemmed, and the trunks have a thickness that feels substantial and sculptural. Their versatility makes them great for small urban gardens. Grey Birch is a deciduous native to the Northeast. It is a fast growing tree that does well with sunlight and moist, well drained soil. 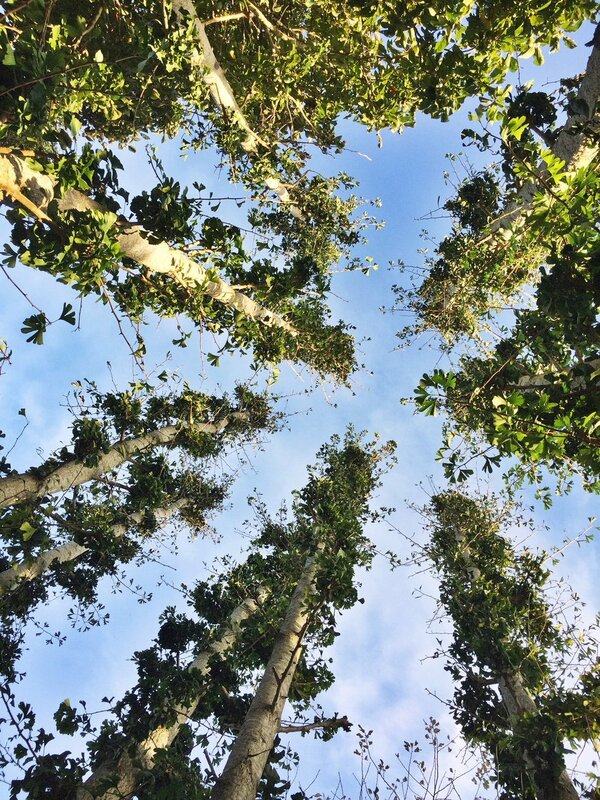 What I love about them is their graceful habit and transparent canopy, made up of small delicate heart-shaped leaves, their white bark, and their golden Fall color. Certain species are susceptible to bronze birch borers, so beware...but there are many varieties so check which is suited to your conditions. Amazing article from the New York Times about Trees, and why identifying a few can be energizing to the soul. I recently was hired to work on a residential project in Pawling, NY. It is on a gorgeous piece of land that overlooks a pond, and the view is extraordinary. The house was existing, and was skillfully renovated by the Architects Khanna-Schultz. The Client wanted to build an extension (for an indoor pool) which resulted in a pretty big tar roof extending beyond the deck. Not ideal for taking in such a view...so when the Client mentioned she wanted a Greenroof, we were thrilled. Robert Schultz had been in touch with a few companies and finally found a great one, called Eco Roofs. Greenroofs are basically roofs that are partially or completely covered with vegetation. They look incredible and they have strengths that go beyond pure aesthetics: They 1. Cool the atmosphere by absorbing heat 2. Absorb rainwater 3. Add insulation to your home, reducing the need for heat and cost associated, and 4. They provide wildlife habitat and. 5. They actually extend the life of your roof, protecting the membrane from the weather and wear. They come in two different forms: extensive and intensive. Intensive greenroofs have a greater soil depth (6"+) which means you can accommodate a greater mix and diversity of plants, perennials and grasses, but they are heavier in weight and require more maintenance. Extensive roofs have a shallow soil depth (1"-5"), are much lighter in weight, and require less maintenance. The one photographed above is an extensive greenroof. The Eco- roof system was exactly what this project needed. We needed a green roof system that was very lightweight, easy to implement, and low maintenance. Eco-Roofs is a grower and supplier of an extensive system pre-grown green roof trays in southwest Michigan, (their parent company Twixwood Nursery is a family owned groundcover and perennial nursery with almost 50 years of horticulture experience). They provide sedum mats, plants and plugs, and they can ship to you directly. They have been in this business for a long time--50 years--and have developed a variety of products in that time. The one we ordered for this particular project was sedum planted in trays that form a grid can be placed side by side on a roof. When pushed together, the trays appear pretty seamless, like a green shag carpet (maybe not quite so 70's). Sedum are extremely drought tolerant and hardy, so unlike an extensive system, they require very little maintenance (maybe some watering and fertilizer occasionally). Their trays are a a stunning mosaic of color and texture, all sedum(they grow about 12 different varieties and can tailor the mix to your specific requirements based on where you are). I loved how it connected the architecture to the surrounding landscape. DOES MY ROOF HAVE A WATERPROOF MEMBRANE? Most roofs already have a waterproof membrane, but if you are starting from scratch, this is a must. Better to ask and make sure. This system is compatible with most waterproof membranes. Ask what type of waterproof membrane you have, and if you don't have one, opt to have one installed that is of a higher quality if you are planning to have a green roof installed. HOW MUCH WEIGHT CAN MY ROOF HANDLE? I always recommend having an engineer weigh in on load, no pun intended. These sedum trays are lightweight, but they're not nothing, and with the weight of say, a big snowstorm, the pounds can add up. Better to be safe than sorry when it comes to the structural integrity of your home. When the trays arrived, we lined them up on the ground below the pool house. You can see the stairs to the deck which were used and then carried onto the roof. We gave them good watering beforehand as they had been in transit for a couple of days. Wall Thickness: 150 mil (more than 1/4″). No lip allows flush fit. Color: Black for enhanced UV resistance. Handles: Molded into the tray on both ends for safe, convenient carrying. Drainage: 46 hole (3/8″) in the lowest points of the tray and edges; Bidirectional drainage channels molded into the bottom of the tray. Water Reservoirs: Minimal to avoid root rot. Media: Engineered growing media meets German FLL guidelines. Plant Types: Standard Sedum; Can be grown to full established (95%+ coverage) with enough lead time. Other approved plants may be possible. 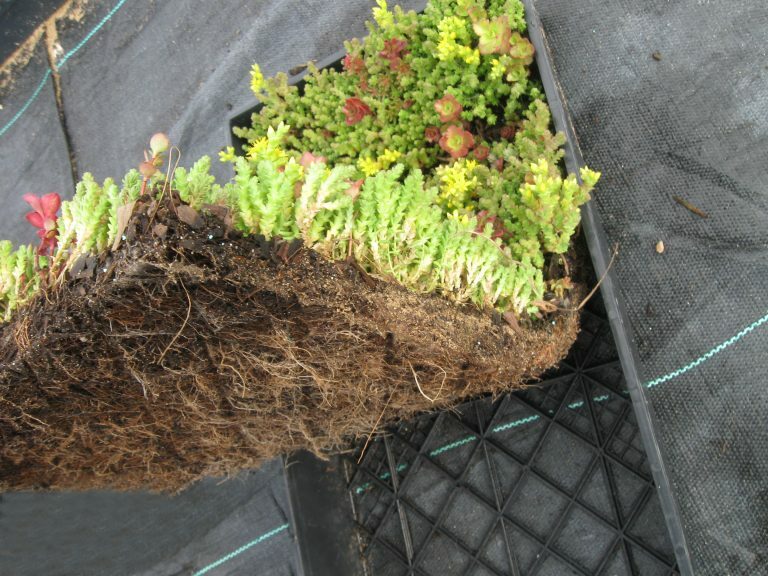 Eco-Mat Pre-Vegetated Sedum MatSedum cuttings rooted into a coir blanket designed to reinforce soil and roots for green roof vegetation. The mats are pre-grown on speculation with a standard mix of at least 8 varieties of performance proven Sedum species. Full Brochure available here. Place on 3″ or more of green roof media above filtration, drainage and protection fabrics. Plus the weight of the media and layers placed under the Eco-Mat and any potentially retained water by those components. Typical installation with 3″ of media and minimal water retention reservoirs will be 25-35lbs/sf for full system when fully saturated. Plant Types: Standard Sedum; Can be grown to full establishment (95%+ coverage) with enough lead time. They are very carpet-like...compact with efficient root systems. and so beautiful close-up, too. Visit Eco-Roofs to find out more about this wonderful product and company. Nigel Dunnett is an incredible Greenroof Designer in the UK, creating beautiful landscapes including many green roof parks, some atop parking structures in the middle of cities...you wouldn't even know they are green-roofs unless someone told you. It's kind of boring to talk about soil but we should, because it is fundamental to a garden doing well. For me, soil has always been one of those weirdly elusive aspects to putting together a garden. What makes a good soil? Where do I find it? And more importantly why should I care? Isn't dirt just dirt? Well, not really--soil actually matters a lot. You can have all of the components of a garden you need--great design, the right plants, the right light (or shade), but if your soil is of poor quality, it's a deal breaker. Consider it your plant's diet. Without getting too technical, Carbon, Hydrogen and Oxygen are the obvious natural elements needed for plants, and those are supplied by air and water. But then there's the other stuff, which Espoma calls Primary, Secondary, and Trace nutrients. Primary are Nitrogen, Phosphorus and Potassium. Secondary are Calcium, Magnesium and Sulfur. Then there are the trace elements like copper, iron, nickel, zinc and manganese among others. There are actually nineteen elements necessary to healthy plant growth. Each contributes to a specific aspect of the health of a plant, whether it is leaf health, root health, or flower/bud health, etc. Espoma Organic Soil is a great soil company to know about. It has been in the business since 1929, which is way before organic became a buzzword. Since then, they have developed 48 products that are each designed to target and enhance specific plant types organically. As a result, their products are excellent; I specifically like the Holly-tone for acid loving plants, and Rose-tone, which I have noticed works on a variety of plants, not just roses. Organic is not much pricier, and it's way better for your garden and the environment. A regular bag 16 quart bag of Miracle grow costs only $2.00 less that the same size soil bag of Espoma Organic soil. And yet it contains toxic pollutants that do not contribute to the longevity of your plants. Miracle grow and other similarly mass-produced soils and fertilizers contains chemicals that are harmful if ingested, so if you have children or pets, you really need to be aware of how you are using non-organic products in your garden. And here is the larger issue: chemicals in your soil leach into public waterways, which are absorbs by other plants, animals, insects and humans--so if you think your little garden doesn't make a difference, it actually does. Here are many reviews of Miracle Grow soil from Consumer affairs and it is not pretty. And incidentally, Espoma just came out with 6 new liquid products that are enhanced with microbes and proteins for your plants that are pre-measured. You literally just flip the cap open and squeeze the bottle and a dose is pre-measured to your watering can. They make them for indoor plants, as well as cacti, violets, and orchids. You can read more about Epsoma's liquid fertilizers here. I have tried them on my indoor plants and they are so much greener! 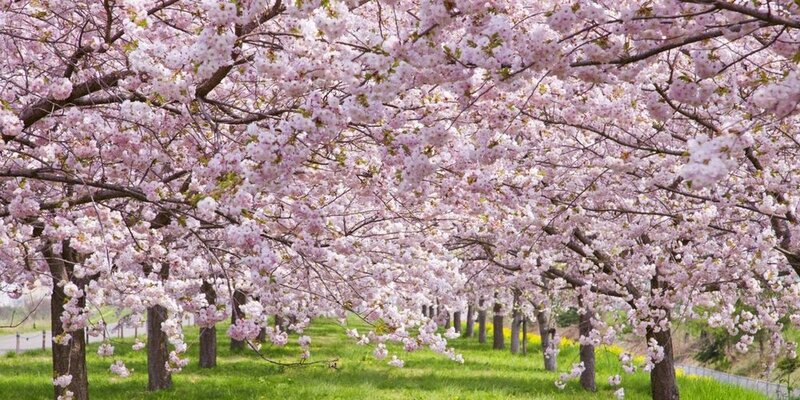 Cherry Trees are in full effect at the Brooklyn Botanic Garden, and it is seriously not to be missed if you have never been, and even if you have, it's a serious de-stressor. New Documentary entitled Five Seasons: The Gardens of Piet Oudolf is out, and it looks amazing. An Exhibit of photographs, Scenes Unseen, is a collection of rare glimpses into park life in 1978 in NYC at the Arsenal in Central Park, 830 Fifth Avenue near 64th Street May 3-June 14.